Home » Photography » Digicam Explosion => Too much documentation ? Digicam Explosion => Too much documentation ? A question in CAT 2007. Nevertheless, photographs still retain some of magical allure that the earliest daguerreotypes inspired. As objects, our photographs have changed; they have become physically flimsier as they have become more technologically sophisticated. Daguerre produced pictures on copper plates; today many of our photographs never become tangible things, but instead remain filed away on computers and cameras, part of the digital ether that envelops the modern world. At the same time, our practice for the creation of images has also eroded. Children today are used to being tracked from birth by digital cameras and video recorders and they expect to see the results of their poses and performances instantly. The space between life as it is being lived and life as it is being displayed shrinks to mere a second. Yet, despite these technical developments, photographs still remain powerful because they are reminders of the people and things we care about. Images, after all, are surrogates carried into battle by a soldier or by a traveller on holiday. Photographs, be they digital or traditional, exist to remind us of the absent, the beloved, and the dead. In the new era of the digital image, the images also have a greater potential for fostering falsehood and trickery, perpetuating fictions that seem so real we cannot tell the difference. Anyway, human nature being what it is, little time has passed after photography's invention became means of living life through images. For the above question (1) is the right option. Relax, I reproduced this question not to discuss english usage in CAT, instead to discuss about advent of digital cameras in our everyday life. Recently a post Overly Documented Childhoods in desicritic(dot)org says "when I compare that number with the pictures that kids have today, its mind-boggling. 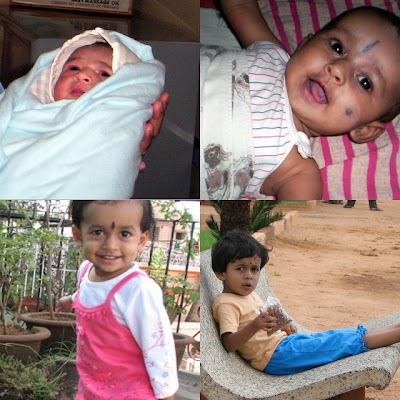 Our two nephews are 6.5 and 3.5 years old today, and we've seen and clicked hundreds of snaps of them since the time they were born. A recent 5 day vacation yielded over 400 snaps and its safe to say that they were there in about 75% of them". I can very much relate to this statement, since I have taken pictures of my two and half year old niece right from the moment she was out of her mother's womb. 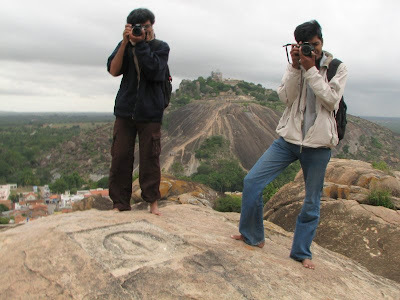 Not only childhoods, even every trek/trip is getting documented like anything. When we go in group, every 4 out 5 people will have cameras from compact digicams to SLRs. As a results there will be aggregate collection of 3-4 GBs snaps at the end of every trip. Earlier(4-5 years back), first task after a trip was a give the negatives for development, now it is to upload the snaps in online photo albums. Before that we have filter out 90% of snaps, which are taken either for timepass or for 'trial and error'. But, sometimes these timepass snap comes out really well. One more funny snap in 'Bangalore Weekend Shoots' community of flickr. The picture captures a aritisan being shot seven photography enthusiasts. This is one of my favorite snaps in flickr. To put in a nutshell, I subscribe to the opinion which is correct answer choice of CAT question. Even though, there is a kind of photography(digicam to be precise) explosion in our society, a few snaps turn to be priceless. What do you say ?